What’s being done to keep the city moving safely and efficiently, on multiple modes of transport, now and for the future. With a multi-billion dollar projected price tag and a rollout timeline of 30 years, when (and if) completed, the Green Line will add more than 40 new kilometres to Calgary’s existing 59 km of track. It will move 90,000 to 140,000 commuters daily, reducing the commute time to downtown from the furthest planned south station – Seton – to 35 minutes, from the current 60 to 90. 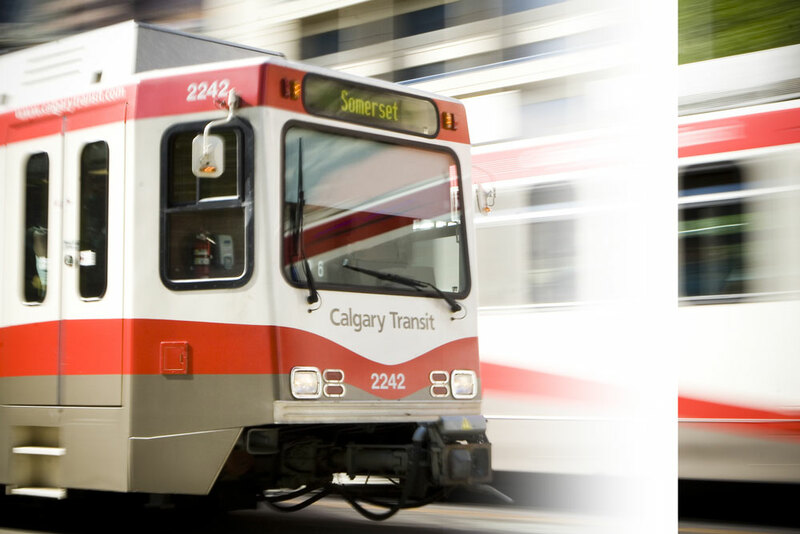 Calgary’s light-rail transit system is already one of the busiest transit systems on the continent, serving 320,000 passengers on the average weekday. That the Green Line is a needed expansion and that it will be a heavily used addition to Calgary’s existing transit system is not in question. But, as is inevitably the case with massive, long-term and expensive projects, it is not without controversy. The biggest lightning rod is, as always, who will pay for the damn thing? The short answer, of course, is tax payers – all of them. Calgary’s municipal government committed $520 million toward the project back in 2013, via a $52 million annual allocation from 2015 to 2024 – then tripled that commitment in December 2015, agreeing to put $1.56 billion into the project over 30 years (contingent on matching funds). The federal government came on board in July 2015, announcing it would grant the Green Line $1.53 billion from the Public Transit Fund. That leaves a few billion outstanding. The exact amount can’t be determined because the price tag is always evolving, but the expectation is that these funds will come from all levels. The 2015-16 provincial budget contains still unallocated infrastructure funding, including funding under the Green Transit Incentives Program. The City formally approached the Alberta government in January 2016 to get a piece of that infrastructure and transit pie for the Green Line project. Given the stated priorities and philosophy of the Rachel Notley NDP government, the province should come through. Right? Given the state of the Alberta economy, the amount and timing of a provincial financial commitment is less certain. The City of Calgary has voted to begin acquiring land needed for the first phases of the project’s construction and “has support from all of council as a whole,” says city transportation spokesperson Julie Yepishina-Geller. Money’s the biggest concern, but not the only one. For non-transit-using Calgarians, transit expenditures are often a hard sell, particularly when their car commute suffers in the short term during the construction phases. Determining the least disruptive and most cost-effective alignment for the massive Green Line has been a huge challenge for planners, particularly when it comes to getting the line across the Bow River and through downtown. The least disruptive option – a tunnel under the Bow and much of downtown – is also (surprise!) the most expensive option. But it also provides the most opportunity for further development downtown. Thus, it’s probably the one that will prevail and, regardless of what happens with provincial funding, so will the Green Line. The City says it hopes to know by this month if and how much the province is putting in, so it doesn’t face delays because it missed out on the construction season. That said, the scope of the project means it needs to unfold in stages no matter what. A construction timeline will be set when funding structure is determined, and extensive consultations with affected – or just interested – Calgarians continues. -M.C. How do those travel time signs work, anyway? Ever wondered how those signs know that it’s 15 minutes to the airport? The City uses Bluetooth tracking technology to estimate travel times between points on Deerfoot Trail, Crowchild Trail and Glenmore Trail. On Deerfoot, there are 15 sensors and seven permanent message boards that collect publicly available data, which is used to measure travel time and congestion. If you have a Bluetooth-enabled device, chances are you’re helping generate the results, so Big Brother is definitely watching, but not to worry. The technology encrypts and monitors Bluteooth signals without tracking other information, so people’s privacy is protected. -J.H. There are more than 40 roundabouts in Calgary. Hard to believe, since so few people know how to properly navigate them. When they work as designed, they are proven to move traffic more efficiently than intersections with traffic lights – they reduce head-on collisions and T-bone crashes, and are better environmentally since there’s no idling at red lights. Arguably, then, we should have more of them, right? The City agrees. Its policy is to use roundabouts as the preferred option for arterials and collectors in new communities that may warrant a traffic light or all-way stop, or in existing areas where a traffic control upgrade is needed. If this is the direction we’re headed in, it would behoove Calgarians to brush up on their roundabout rules and etiquette, especially with regard to signalling. Signal left when entering a roundabout from the inside lane (and keep it on until you’re ready to exit). Signal right to indicate you’re exiting the roundabout. And, remember, cars on the inside lane have the right of way. Cars on the outside lane yield to cars exiting from the inside. If you plan on exiting in one of the first two exits, use the right lane. Otherwise, stick to the left. -J.H. When the cycle track network was first approved by council in April 2014, it was a close call, getting the go-ahead from an eight to seven vote, and the $5.7 million project has kept people debating its merits ever since. “We don’t base this on any statistics and we don’t ask our guests, but I can assure you that our bike racks are full basically from open till close. We can see firsthand the amount of traffic on the paths, and as far as it being a positive for us, we can definitely see that,” she says. So what does the future hold for this controversial project? 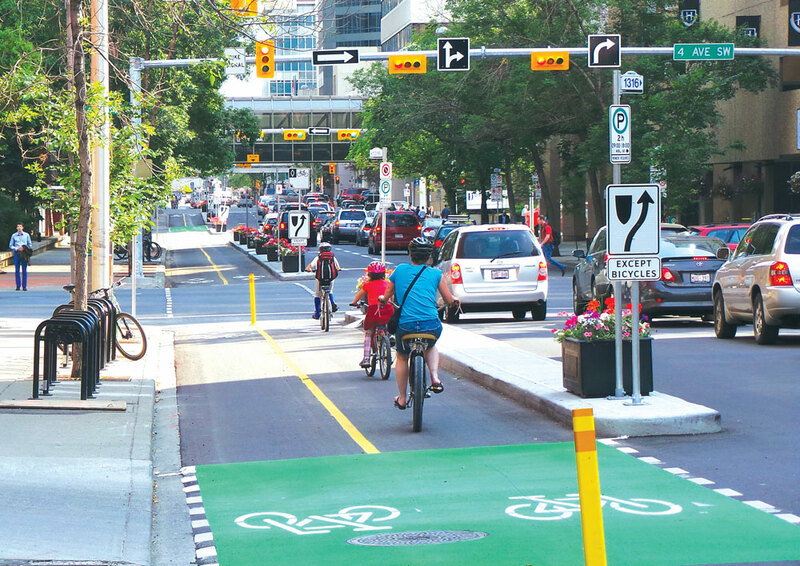 Using data collected over the course of the 18-month pilot from June 2015 to November 2016, city council will review the cycle track network this December. “It could be just keep it, make it permanent, could be to make modifications to some [tracks] and not others, or completely scrap it,” says Thivener. “So the public should definitely let their councillor and mayor know how they feel about this project, especially down near the finish line, because they represent the people and they should know about how the public feels about the project.” -A.G.
Could self-driving cars come to Calgary? Imagine if, instead of spending your commute gripping your car’s steering wheel, you could spend the trip napping, reading the newspaper or just putting your feet up and enjoying the ride. According to City of Calgary general manager of transportation Mac Logan this ideal commute is not a matter of if, but when. The City of Calgary expects fully autonomous self-driving vehicles to be a major part of traffic within the next 10 years, says Logan. The timeline for semi-autonomous vehicles is even shorter. “I think it’s safe to say within the next five years, you’re going to have vehicles that are, to a large extent, capable of driving themselves for short periods of time,” Logan says. Early vehicles such as the Tesla Model S are already capable of changing lanes or auto-steering with minimal human input, using cameras to read road markings – a limiting factor after a winter of gravel scrapes away the paint. Logan says the City’s approach to the maintenance of markings will be one of the many changes that may need to occur, but ultimately decisions around autonomous vehicles will be based on discussions at both federal and provincial levels of government. Those discussions are underway at a national level but are far from done. Other systems include Google’s LIDAR (Light Detection and Ranging) approach using light from a laser to read surroundings. The cars will actually learn by mapping the roads they drive on, says Logan, so if the city moves a curb there will be an obligation to push that information to the vehicles. Cast your mind back to the far-off days of May 2016, and you may remember a time when many were discussing pedestrian safety, in particular how fast cars should be zipping down residential roads. The lightning rod of the debate was the idea of lowering speed limits in residential areas to 40 or 30 km/h. That reduction was one of the 50 proposals that made up the City’s Step Forward action plan, which aimed to reduce pedestrian casualties and improve walking in the city. In the end, Council approved 49 out of the plan’s 50 proposals, excluding the speed limit reduction. So why was this a big deal? Well, proponents of the lowered speed limit say it would prevent unnecessary injury and death, pointing to studies like one from the Organization for Economic Cooperation and Development, which found that “broadly speaking, each 1 km/h reduction in average speed leads to a 2- to 3-per cent reduction in injury accidents.” This means that lowering the speed limit from 50 to 40 could translate to a 20- to 30-per cent decrease in pedestrian injuries. Cities such as Milan, Dublin and London are either looking into, or have already lowered their residential speed limits, and, closer to home, Airdrie already has a limit of 30 km/h on its residential roads. Some communities (including Elbow Park and Crescent Heights) have lowered speed limits on certain roads. Others count groups that would like to see speed limits lowered, such as 30 for Sunnyside, which advocates for limits within the northwestern community be lowered to 30 km/h. In addition to the obvious displeasure of motorists forced to endure a longer ride, and the divisive nature of pitting commuters against those who live in the communities they drive through, those on City Council who pulled the proposal from Step Forward cite found, among other things, a dearth of information on the subject. Council is expected to review a report from the Calgary Police Service on residential enforcement of such a policy and is also waiting on the province to consider lowering the speed limits, which would save the city the time and cost associated with setting up its own speed limit signs. Council has promised to revisit the topic in November when it hopes to have more information available, so, until then, remember to look both ways before crossing the street. -A.G. The Pace Car program is a nation-wide initiative created to raise awareness about speeding in neighbourhoods, especially in playground zones and pedestrian-dense areas. The program asks people to sign up as Pace Car drivers and then actually drive the speed limit, and also stop for pedestrians crossing the road, share the road with cyclists and not drive distractedly. Volunteers are given official emblems to put in their car window to hopefully neutralize road rage when would-be speeders realize why the car in front is driving so damn slow. Pace Car drivers are encouraged to pull over if someone urgently wants to pass. (Ideally speeding toward the nose of a radar gun.) Currently, the only Calgary communities piloting the project are Rocky Ridge and Royal Oak. To sign up, go to rrroca.org. Or contact the City to see about setting the program up in your own neighbourhood. -J.H. If you think traffic on your daily commute is more congested now than it was 10 years age, you’re probably right. The City measures average daily traffic volume along various stretches of road every year. Here are some comparisons. To quote a famous idiot savant, I’m an excellent driver. My bicycling and walking are also top notch. Unsurprisingly, then, I have a superlative understanding of how to improve traffic and everybody should listen to me. See, I was born in Calgary; therefore, a car is my birthright. In fact, I’m fairly certain my ancestors drove here back in the day. So if you want to take my car away you’ll have to pry it from my cold, soggy driving gloves. Does this make me somehow “better” than others? Yes, it does. What’s more, I live near downtown. In other words, every trip I make goes through the most gridlocked parts of the city. This is not fair and I deserve a break. Let’s look to downtown London, England, where they have what’s called a “congestion charge.” Swell idea. If you’re not from around here you pay a fee every time you enter the core. You want to defile our inner-city streets with your suburbanite-ness? Buck up. Also, if you’re a very, very good driver like me, you should receive additional privileges. For example, I go fast. Why? Duh, for safety – to reduce the time I’m exposed to all the terrible drivers out there. Since that helps to reduce accidents, I should receive some sort of dispensation from things like red-light cameras. I also change lanes a lot, because I’m going to important places. I’m not one of these people just meandering about randomly looking for somewhere to buy an ice cream cone. You know who you are. Recently, of course, there are fewer lanes to change from and to. That’s right, Big Bicycle has really horned in on our action, confiscating lanes all over the place. Speaking as a bicyclist myself, that’s not such a bad idea. But why have dedicated bike lanes even on days that aren’t very nice? If they were just a little wider we could motor on them when it’s cloudy or windy and bikes shouldn’t be there in the first place. And speaking of width, is there something we can do about giant pickup trucks clogging up everything? I swear, some of these trucks are so wide, I can barely squeeze my bike between two of them to get to the front at traffic lights. At which, I’ll remind you, my vulnerable status as a cyclist obliges me to yield only, not stop. While we’re at it, pedestrians need to wise up too. They should be prosecuted if they step into an intersection after the Don’t Walk light comes on. Not fined, either. Jailed. Also, it would be a good idea for everyone to borrow from my big book of pedestrian hacks. Instead of walk-blocking cars who are trying to turn, I go to the middle of the block and sprint across when the way is clearish. You’re welcome. Next, we need to consider transit. Some day, with luck and good management, all those train lines will collapse into dust, making room for some awesome double-decker expressways. They’ll soon become crowded as hell, but don’t worry. Flying cars will almost certainly be here by then. -K.B.